Data Center managers are learning about the inefficiencies of the tile and the costs associated with adding more and more cooling capacity to the data center airflow system. As a result of their pursuit of reducing hot spots and improved cooling, they have developed two, competing, design philosophies. We call these two methods the "River" and the "Lake". The Lake environment relies on creating a large pool of cold air under the floor and in the cold aisle. This pool, or lake of air, is pressurized under the floor. As the pressure is released through the tile, it is expected to fill the cold aisle. The servers are cooled by the internal fans pulling the cold air from the middle of the aisle through the server. The River environment, on the other hand, is designed to use the flow of air to cool. It relies on the movement of air to provide a dissipative effect on the servers and through the server fans. The river method treats the Data Center as an ecosystem of airflow. A molecule of cool air leaves the CRAC unit, moves through the under floor plenum, through the tile and directly into the front of the server, cooling the server then retreating through the hot upper plenum back to the CRAC unit. There are three benefits to the River system. First of all, by breaking down the boundary layer at the front and top of the rack, you are able to improve the cooling capabilities of the airflow system. The second benefit of the River system is that you need less air than you do in a Lake system. 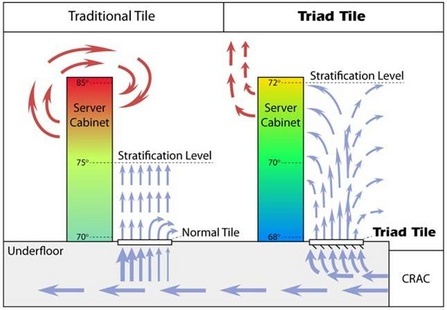 The River system contains the air under the floor, focuses the air to the server by managing the air out of the tile, uses the cabinet door to further channel the air to the servers. It supports an 18 degree delta T in the hot aisle to pull the air from the back of the servers. 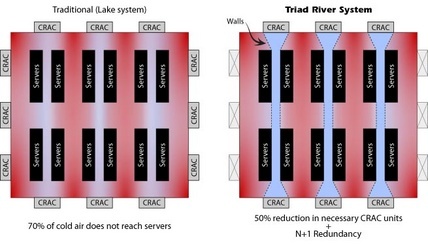 A well-designed River system can reduce the need for CRAC/CRAH generated air by up to 50% and can lower upper server temperatures by 10 to 20 degrees. This can lead to a reduction in energy costs by as much as 60% while reducing the need for 40% of the air handling devices. You get the best of both worlds, lower energy costs for a lower acquisition cost.